A firewood carrier or log tote is a device used to carry small amounts of firewood into your home without leaving a trail of bark and dirt throughout your house. Anyone who uses a wood stove or a fireplace has probably made countless trips carrying armloads of wood. Even though your woodpile might be close to your house, you still need to get the firewood from an outside woodpile into your wood stove or fireplace. What happens when you carry an armload of firewood through the house? A trail of bark, twigs and dirt is usually left behind. Plus, that armload of firewood usually leaves a little dirt or bark on your shirt as well. 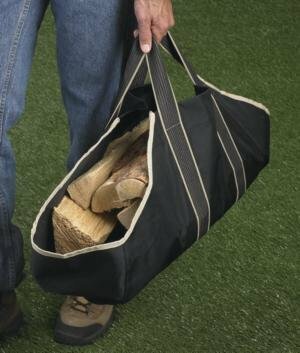 To make carrying firewood a lot easier and a lot cleaner, consider purchasing a carrier or tote. The concept of a log carrier is pretty simple. They're usually constructed of a polyester twill, canvas or even leather and have an attached handle. 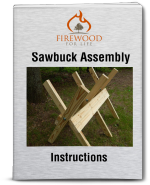 To use one, simply lay the carrier flat on the ground and stack your pieces of firewood inside. Once it's full, grab the carrier by the handles and you're ready to go. Most models have enclosed ends which helps contain the mess inside the tote. The enclosed ends also helps prevent the wood from slipping out of the bag and falling on your floor or even worse....your feet! The totes work best for carrying small pieces of firewood that have already been split and are ready for use. After you unload the firewood inside you will see all of the bark is contained inside the tote. To empty the tote, simply take it outside and shake it out or dump the mess into the trash. You can purchase a polyester or canvas log carrier online or from a nearby store for around $10-$20 however, leather models can be more expensive. Here's one piece of advice when using a tote......don't overfill it! Once the tote is filled you should be able to grab both handles with one hand and carry it into your house. Adding to much wood prevents the handles from reaching each other and requires two hands to hold the tote. Also the increased amount of weight may create a hole or stress the fibers. At an affordable price, a firewood tote can save a lot of time and energy. Plus, you'll love the fact that your floors or carpet remain clean and free from dirt and bark.